February is a waiting time on the prairie. Winter is not over with, and occasional dazzling, sunny days with temperatures up into the 50’s tease us with the promise of spring. The landscape is all colored in shades of grey and brown. You may notice a flush of red in low thickets along the margins of woodlands, however. The bright color comes from the bunches of small fruits clustered along the skinny, arching stems of Coralberry. This interesting member of the Honeysuckle family is common throughout the eastern half of Kansas and is a typical plant of the woodland edge. Its leaves are simple, egg-shaped or oval and grow directly opposite each other on the stem. In winter, you may see a few of them still hanging on to the stems, as in the photo below. It has several cousins within the genus Symphoricarpos and all these are commonly called “Snowberry” because the fruits are white in color. Coralberry is unique in having red berries. The cousins are otherwise similar in the shape and arrangement of the leaves and in their growth habit. A close look at the berries shows how much they look like apples. If you smash one between your fingers, you may even notice a faint odor like that of apple peel. But that is as far as the resemblance goes. Most people find that the flavor of coralberries is very unpleasant. You had better have a glass of water handy if you want to find out for yourself! So what does eat coralberries? A variety of birds such as grouse, quail and various grosbeaks and thrushes make use of this food source. Black bears and wood rats are also known to eat them. However, coralberries don’t seem to be a particular favorite of any of these animals. The leaves are commonly eaten by antelope, deer and other browsers during the growing season. This may be the origin of the nickname “Buckbrush”. The flowers of Coralberry may be seen in early July. They are small (~3 mm.) and appear in clusters along the stem, just as you would expect by looking at the way the fruit is arranged. 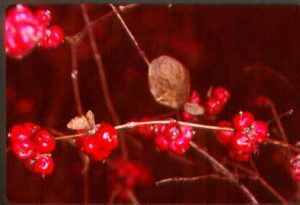 Probably more important than the food value of its fruit, Coralberry serves as good habitat for wildlife. The knee-high thickets provide nesting and escape cover for small mammals and birds. In addition, the numerous stems serve as a structure that collects detritus, which attracts insects and other small invertebrates, which in turn provide food for larger creatures such as ground-feeding birds. Wandering flocks of winter sparrows will often spend considerable time foraging in a Coralberry thicket. 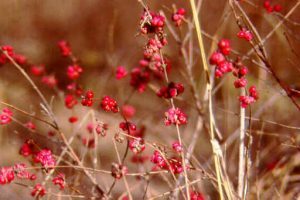 Once established, Coralberry doesn’t need seeds to reproduce itself. It sends out lateral stems up to 4 feet long, which then root and grow into a new cluster. It is these runners that snag your shoe and trip you when you try to walk through a Coralberry thicket. The gloomy, grey days of February will give way eventually to the frantic weather of March. In the meantime, we have an opportunity to look “inside” of habitats that are shut off from view by leaves during the growing season. Make a visit your favorite park or wild area and see what is happening during this Waiting Time. And don’t forget to take a water bottle if you think you might be tempted by those little red berries over there in the thicket at the edge of the woods!